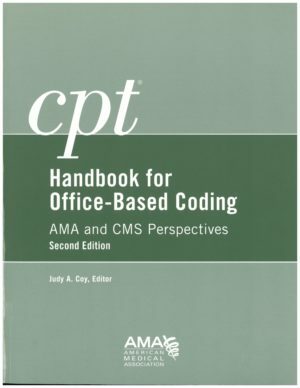 Featuring useful excerpts on CPT code usage from several of the newest AMA publications as well as current national policy information from the Centers for Medicare & Medicaid Services (CMS), this CPT handbook provides tips on where to find answers to state Medicare questions. Readers will also benefit from a detailed glossary, acronyms list, and useful appendices that address a variety of related subjects including National Correct Coding Initiative (NCCI) overview, directory of Medicare carriers by state, health care practitioners recognized by Medicare, Physician Quality Reporting Initiative (PQRI), and common ICD-9-CM descriptors—all in one valuable resource. A time-saving resource to better understanding commonly performed services provided by the office-based physician. The updated second edition delivers physicians and their staff an invaluable reference tool full of coding and Medicare policy information relevant to Current Procedural Terminology (CPT). Developed for side-by-side use with AMA’s CPT Professional Codebook, users will quickly find coding and policy information needed to accurately report and reduce claim denials.